Salome Montgomery fears winter—the cold, the snow, the ice, but most of all, the frozen pond she fell through as a child. Haunted by the voices and images of the strange beings that pulled her to safety, she hasn’t forgotten their warning to “stay away.” For eleven years, she has avoided the winter woods, the pond, and the darkness that lurks nearby. But when failing health takes her grandparents to Arizona, she is left in charge of maintaining their estate. This includes the “special gifts” that must be left at the back of the property. Let me begin by saying how GORGEOUS this cover is. This is one of those examples of a cover alone being able to sell a book. I would be hard pressed not to pick this up if I saw it in a book store. 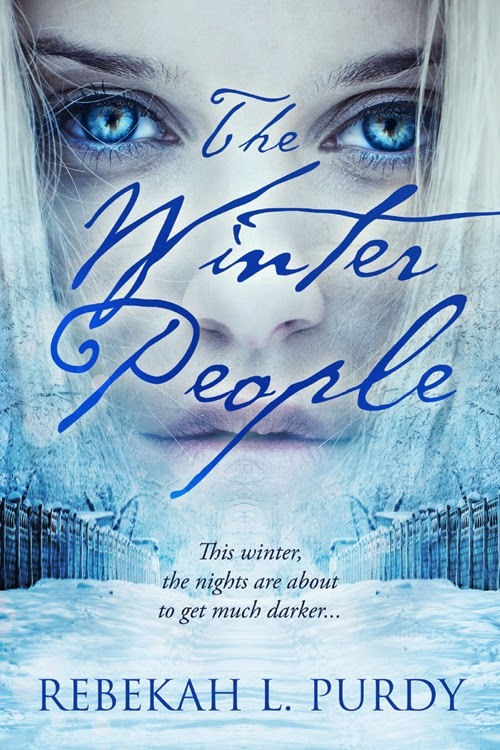 The Winter people starts off with an emotional bang, the prologue sending us back to the day six year old Salome has a near-death experience that changes her life forever. I loved the imagery in this book. It was so easy for me to imagine young Salome running happily through her grandmother's snow-filled yard, the look on her face the moment she begins to hear the voices and then when she discovers 'The Gate' open. Fast forward eleven years and we meet a beautiful seventeen year old Salome who has struggled the majority of her life with an over-riding fear of winter. After her tragic experience at the age of six Salome has basically locked herself away every winter, the first signs of a winter chill sending her in to panic mode. This winter however is different, not because her fear is different but because her grandparents are leaving for warmer climates due to health reasons and this leaves Salome in charge of tending to her grandmother's strange winter rituals. Not only that but the hottest guy in school, the school basketball star, Colton has asked her, HER of all people, out. Could he be the cure to her winter phobia? Along with Colton we end up meeting the mysterious Nevin, a pale strange 'boy' who Salome runs into on her grandmother's land. Nevin draws her in and seems to know the answers to all the questions she's been afraid to ask over the years, but will he help her? Who is he, does he want to be her enemy, her friend, or perhaps...something more? And then comes Gareth (Hellooooo Gareth, *swoons*), this monster of a guy who is all rough around the edges but seemingly watches over Salome as though he were her bodyguard. Always there when she needs him most. Who is he and could he possibly care for her? The one thing that bothered me about all of these 'boys' is that Salome is constantly talking about how they each made her feel something, drew her into them. With each one I was certain she was going to run off and suddenly fall in love. It gave me a bit of whip lash watching her interactions with each of them, lol. However, as I read further into the book I began to understand why this was happening. I can't tell you though because I don't want to give anything away. I don't want to tell you all the books secrets and trust me, there are many! Which leads me to my next point, There isn't a whole lot I CAN say about any of the characters other than I am very disappointed in her dad and don't truly get the point of that situation, but I am thinking that maybe it plays a part in future books. Also Salome's best friend Kadie, yeah...she was a good friend and I really wanted to like her, but her boy obsession drove me batty. It's a good thing she was Salome's friend and not mine because I may have very well popped her one. Anything else I say would end up giving away critical information that would ultimately take away from your reading experience. Every character in this story has a purpose, each small detail that happens happens for a reason. I will admit it drove me a bit crazy because I wanted to know what the heck was going on. I needed to know who the bad guy was and why all of this was happening. I think that you will be a bit surprised by the outcome. This is a great suspense fantasy teen read. I think that it is a fantastic choice for younger teen readers and I know I am looking forward to getting back to these characters in future books! I was born and raised in Michigan (just look for the giant mitten on the map—it’ll likely throw a snowball at you). I spent most of my time in Michigan, but while in the army got to call KS, SC, MO, and CA home for awhile as well. As a kid my family moved around a lot. Try spending both your freshman and senior years at new schools (yeah, loads of fun). I could’ve changed my name to “new girl”.